A true outdoor carpet, Artificial Grass not only looks great but requires no watering, no mowing and no feeding, giving you more time to enjoy life. 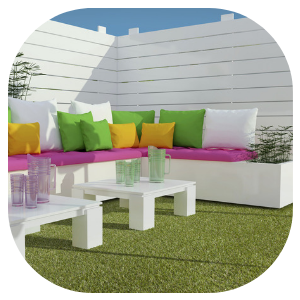 Available in an array of blade lengths, colours and textures, Artificial Grass is aesthetically close to the real thing but comes without the continuous hassle of maintaining. At Bramley Carpets we have a wide variety of Grass products available at both of our showrooms so feel free to come in store and take a look for yourself. No More Mowing- Mowing the lawn will be a thing of the past, simply giving your lawn a sweep or a rinse with the hosepipe is all that's needed. Beautiful 365 Days A Year- Most natural lawns only look good for periods of the year, whether it's from the kids playing or heavy rainfall many factors effect its appearance. Artificial Grass will look the same year in year out. Good Looks- Artificial Grass comes in many options that are designed to replicate natural grass, some will even say it's impossible to see the difference. Upkeep- Since it doesn't need watering or feeding, Artificial Grass will not turn brown or look worn out like natural lawns, it simply takes care of itself. Price- Although some people claim that Artificial Grass can initially be expensive, it's non comparable to the the cost of maintenance, hours of labour and hard work that's needed with a natural lawn which will need continuous investment for years to come. Guarantee- All of our grass products are manufactured to the highest standards and are backed with warranties ranging from 5 to 20 years. Pet Friendly- If you're frustrated with your dog digging up the garden or the aftermath of muddy paws through your house then Artificial Grass may be the best option for you.